When Fir Park was opened in 1895, it was laid out in a wooded area belonging to Lord Hamilton of Dalzell, whose racing colours were claret and amber. Since then, the location of the stadium and the choice of club colours have been intrinsically linked. 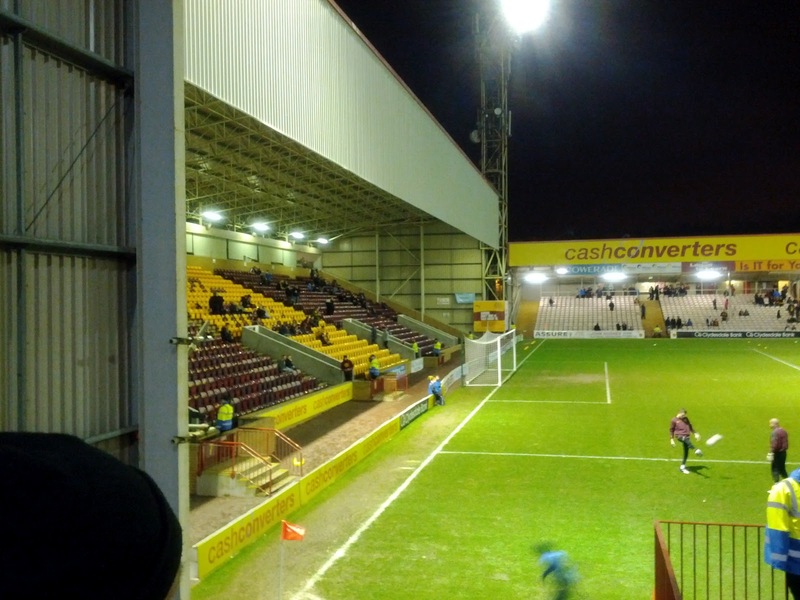 For most of the following century, the only stand at Fir Park was a two-tiered main stand. Numerous developments between 1960 and 1990 saw the ground change in shape and size with the addition of enclosures and standing areas and so on. 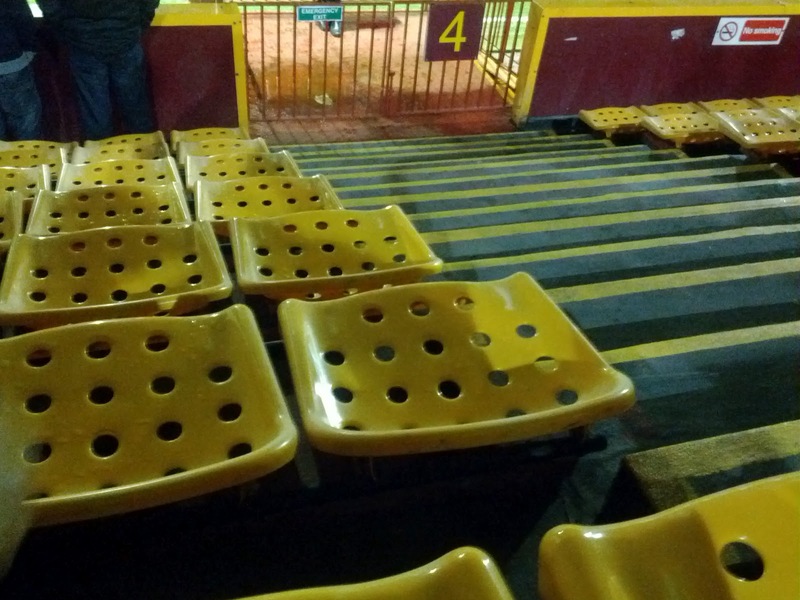 It was only in 1990 and the Taylor report that mandated all top division clubs develop all seater stadiums, that Motherwell faced a bit of adversity. Economically, the club and town were hit by the closure of the nearby Ravenscraig steelworks. However, one of the most famous days in the club’s history – the 1991 Scottish Cup win over Dundee United – also resulted in a lifeline for the club with the £750,000 conversion of the East Enclosure to seating being funded by that cup run and win. A two-tiered South Stand and single tiered north stand came over the following years to complete the stadium in its present format. 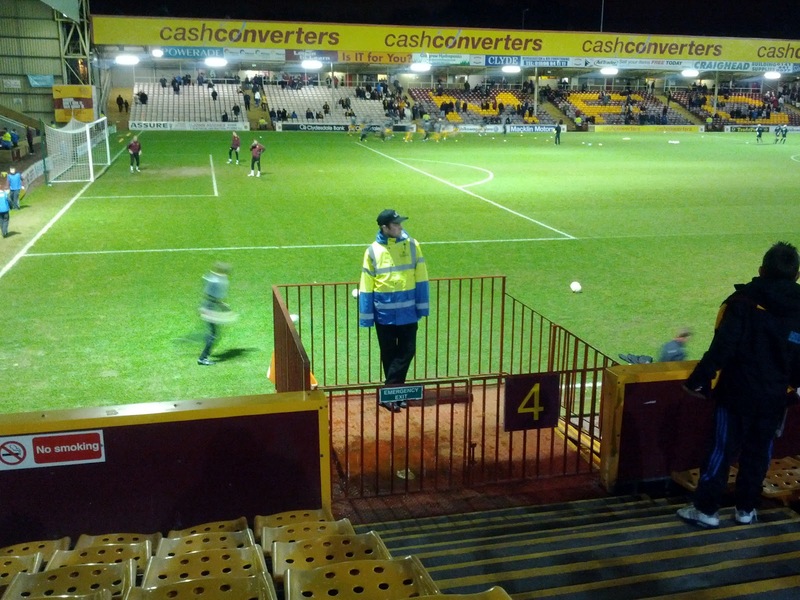 Today’s Fir Park is rather bizarre in that the method of entry to each stand is entirely different. Before any smart a*se says “What, through a turnstile?” I will explain – this is because all stands are a different shape and size. Entry to the East stand is via the end of the stand after which fans will walk towards the centre to take their seats. The Main Stand has a thousand different entrances and a maze of stairwells once you are inside, while the South (away) stand and the North stand also have their own unique methods of entry. Hopefully the pictures below will demonstrate what I mean about size and shape. All that said, I like the fact it’s all a bit messed up and different. It adds a quirk-factor to the ground which is important. Something I also found a delight was the presence of bucket seats in the Main Stand. My god I love a bucket seat and how much room is afforded to you. It went down an absolute treat. 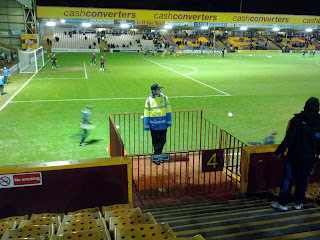 I was also intrigued by Motherwell’s choice to cage in their match-day Stewards! This cheeky chappy below was obviously considered far too much of a risk to the fans and needed locked away. Question I would have is, why hire people to act as stewards who need shut away? Doesn’t make sense, Motherwell, simply doesn’t make sense! 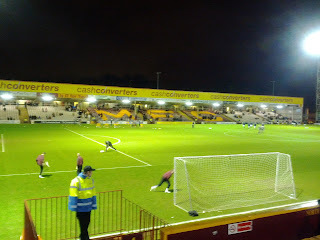 In terms of catering, I found Motherwell to be a decent performer as well. A pie and a tea meal deal for £3.20 went down quite nicely indeed and, quality wise, it wasn’t half bad either. I even heard rumours of Motherwell occasionally handing out free fruit to people who buy hot (and by hot they mean incredibly unhealthy) food at the ground on match days. Impressive initiative. I obviously didn’t want any of that rabbit scran though. I’m a real man so I am! I eat like a bear…not a rabbit! Speaking of Bears, who knew that Motherwell had dancing bears as pre-match entertainment? Unbelievable stuff! I was disappointed to see, on closer inspection, that they weren’t real bears....but the mascots (Claret and Amber) were a credit to their club, busting some fantastic moves on the pitch before kick off. My personal favourite effort from the pair was during a mash up of Sweet Dreams by the Eurhythmics and U Can’t Touch This by M.C Hammer. Claret appears to have the sensual hips of Shakira while Amber had moves like jagger himself (copyright Maroon 5). Mascots aside, the Motherwell fans were brilliant. Not only did they turn out in big numbers but they were noisy, encouraging, knowledgable and amusing all at the same time. One of the best sets of fans I’ve sat in with at a football game, I’d say. They score exceptionally well. I guess one of the reasons the fans were so vocal was down to the excellent showing from their side on the park. Although Hibs were the better side for the majority of the first half, taking a 1-0 lead in at half time, the home team came out in the second half and delivered as good a performance as you’ll see from a team in any league in Scotland. Well….attacking performance certainly. The first period saw Motherwell struggling to get to grips with Leigh Griffiths up top for Hibs and the midfield running of the big fella, Osbourne. Defensively they looked shaky and up front, nothing was sticking with big Michael Higdon or wingers, Jamie Murphy or Omar Daley. In the second half, the midfield really got to grips with the game with Nicky Law starting to dictate things from the middle of the park allowing Murphy, Daley and Ojamaa to start running Hibs ragged. The latter in particular, winning two penalties for his team and generally causing the Edinburgh team all sorts of problems. All round Motherwell were slick, dynamic and played an impressive mixed style of football (by that I mean combinations of short passing play, direct stuff and going long when necessary) that Hibs simply couldn’t deal with. Four goals, going on six or seven at times. Defensively, they were quite poor, especially from corners with Hibs scoring twice from such situations, but in attack they had enough and pulled off a superb win that looked really unlikely at half time. Michael Higdon: I sent a tweet at half time saying “For such a big unit he has been truly awful at times” – and then he scores a second half hat-rick including one of the best overhead kicks I’ve seen for a while. When he’s on form the big man is simply unplayable. When he’s not, he looks pretty terrible. There’s no doubt he was on form in the second half though. His touch, spatial awareness and finishing were first class. I even caught him smashing home a penalty. Henrik Ojamaa: Again, a second half performer. I asked one guy sitting behind me “What do they feed him at half time?” to which he said “I reckon a couple of lines of coke!” – I’m more inclined to believe he gets fed raw meat based on his efforts and energy levels. What a pest he is and technically, he’s also very good. Head down, and looking to shoot almost every time, he’s very entertaining to watch. 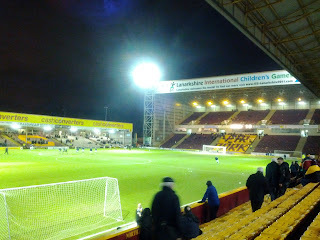 It cost me £10 to get into Fir Park on this occasion which was unbelievably good value for money. Generally speaking, it would’ve cost £22 and that would still be fantastic value – compared with paying similar prices to see Hibs and even more to see Rangers. With that said and, based on Motherwell’s first half performance, I’m gonna have to mark this section a little lower than I would have done had their been a top display from the Steelmen for the entire match. Much like the last post at East Fife, a less than impressive 45 mins has ultimately cost Motherwell top spot in the Ode to the Wee Red Book best supporter’s experience. However, like East Fife I would have to say that it was absolutely brilliant to be at Fir Park and to anyone who hasn’t been…….please go! Motherwell under Stuart McCall are a fine side and I very much doubt you will be left disappointed.